My search for a potato ball in the Southland has led me to experiment with attempting to create them in the safety of my home. It should be easy, right? I’ve been eating them for more than a year. And during those times I’ve pondered and examined the objects in question, noticing the nuances of the bread-crumb coating, or whether the potato ball was hand-made. I thought I had it down. It wasn’t easy and unfortunately, success was nowhere to be seen. Ground meat is precooked with sofrito. Sofrito is a sauce consisting of tomatoes, garlic, onions, red peppers and herbs. Some people swear by making their own much like some people swear by making their own spaghetti sauce. I instead purchased bottled sofrito. 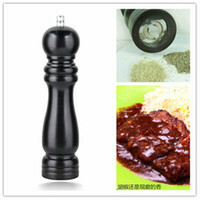 The sauce was added to the cooked meat according to taste. The seasoned meat is refrigerated until cool. During that time, I prepare the mashed potatoes. This part is relatively self-explanatory even for the most novice cook. But one note regarding the consistency of the potatoes is no chunks. Now begins uncharted territory. How big to make the potato balls? I figure anything bigger than my palm would make the process difficult. 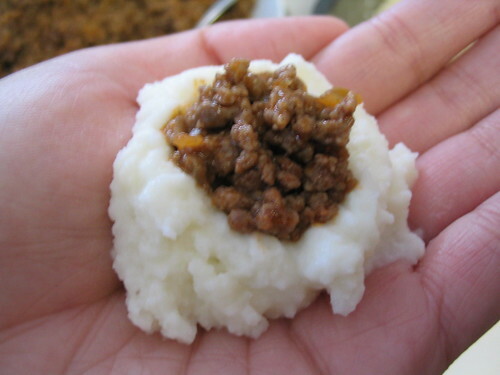 About a tablespoon of potatoes is nestled in my palm, topped off with the cool meat mixture. Another dollop of potatoes on top, enough to encase the meat, finishes it off. The next final addition is the bread-crumb layer. I opted for Japanese bread crumbs, panko, for texture. 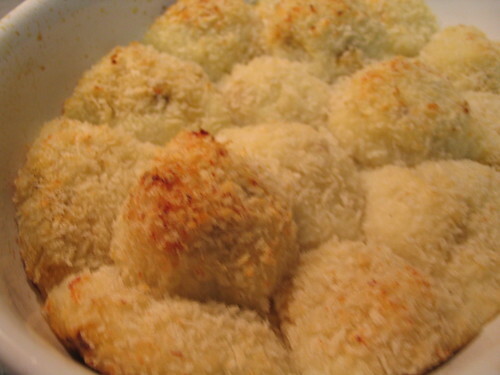 The golf ball-sized potato balls are rolled into the bread crumbs and chilled in preparation for the cooking phase. This is where things start to fall apart… and I mean that literally. What else is there? Frying. It must be. Enter a (possible) major flaw in the assembly: absence of egg to help bind the bread crumbs to the potato. Big miserable mistake. It was inedible and still cold in the meat core. 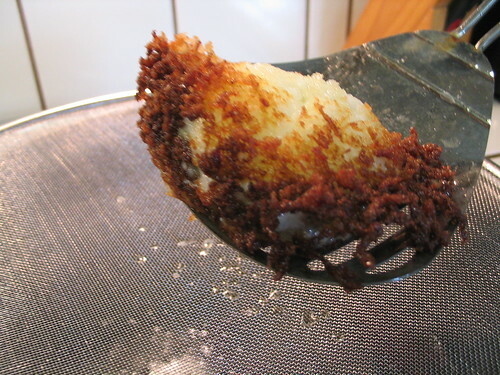 Even retroactively rolling the chilled potato balls in egg produces a molten mess. The effort and time seemed lost. Enter the casserole. 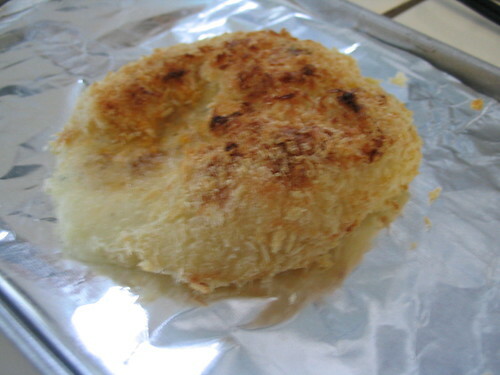 The premade potato balls are layered in a buttered dish. Can’t be eaten it by hands and not exactly portable but it’s still delicious. Hi Mrs. Wong–Next time you drive back to San Diego from Northern California, you should stop by Porto's Bakery in Burbank. It's only a slight detour and the 101 south or 134 is nearby. Potato balls are only 81 cents there and the bakery is divine. I'm sure you'll find something the boys would eat! 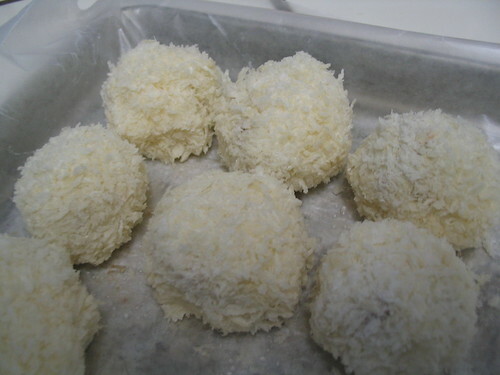 I've tried potato balls from Porto's but after reading your blog, it seems so much more difficult to cook. I'll stick to buying and eating them. Not cooking them.Nice chart. WOW! Love that chart… looks like an old U-T production there! Well done. Of course, i'd use faque meat in mine… if you ever get the recipe on this worked out to perfection, and i'll bet you could do it, i'll be tryin' it out vegan style. Hi Kleopatra–Well, I did have someone else do the graphic. I just art directed it.Hi Susan–Thanks so much for the recipe! I'll try it out the next time I'm feeling brave and report on it. If you run into them in Australia, I would be interested in what you thought of them.I enjoy your blog too! 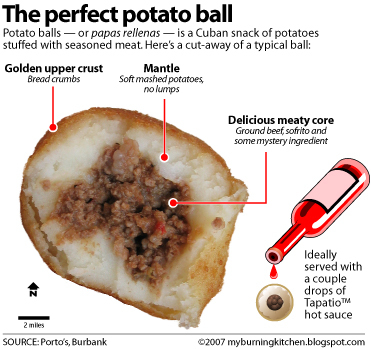 A valiant effort nonetheless, and continued experiments are heartily endorsed by this potato ball afficianado. Photogirl–Thanks for the links!I would love to learn how to make tortillas! I've only watched them being made.